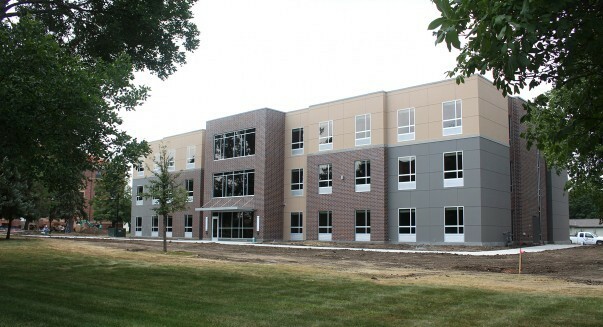 Dakota Wesleyan University will dedicate its newest residence hall on campus this month with a ribbon cutting for Dakota Hall. The dedication will be at 11:30 a.m., Tuesday, Aug. 14. There will be a brief program, light refreshments and tours of the new building. Inside, there will be a massive mural commemorating the founding of Dakota University in 1885 – the original name of Dakota Wesleyan University and the inspiration for the residence hall’s name, Dakota Hall. Dakota Hall is just more than 30,000 square feet with 57 rooms and a 114 occupancy. There is communal space and a study room on every floor, a kitchenette on first and third floor and a laundry room on second. The building is also set up for both wired and wireless internet.